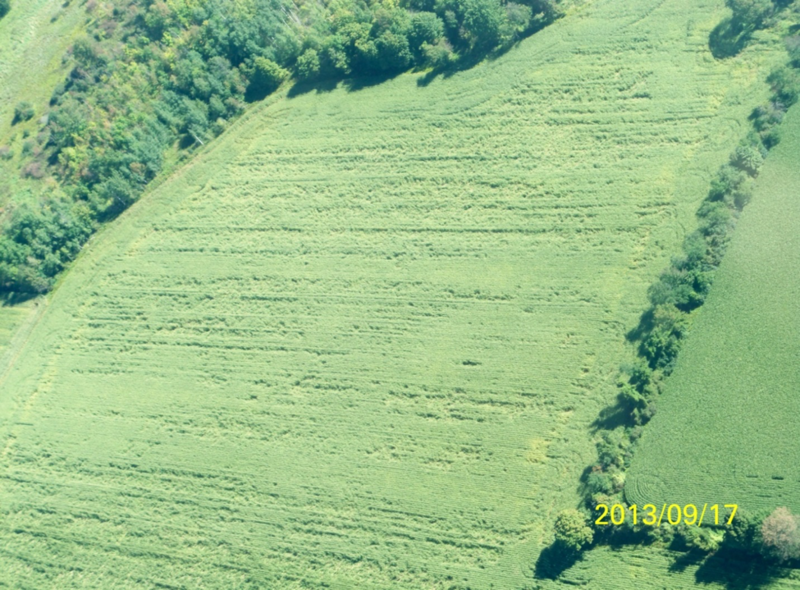 Aerial view of lodged corn from extensive corn rootworm larval feeding. An increasing number of dairy producers are being asked by their milk processors to seriously consider producing milk from dairy cows fed non-GMO forages and grains. Many milk producers feel the pressure to comply with the request in order to preserve their milk market. The decision to grow non-GMO corn impacts both the weed control program and management of corn rootworm. A review of the biology of corn rootworm is a good starting point for this discussion. Adult corn rootworm emerge from existing corn fields around the first of August, where the larvae have been feeding on corn roots. Adults begin emerging around corn pollen shed and start feeding on corn pollen. After about 3-weeks, the females begin to lay eggs in existing corn fields. The eggs overwinter with the larvae hatching the following May. If the field is planted to corn, then the larvae start feeding on corn roots, but if the field has been rotated to another crop, the newly hatched larvae die. Since eggs are laid in existing corn fields, first year corn has zero risk of corn rootworm damage in NYS. In terms of risk, second year corn fields have a 25-35% chance of risk for rootworm damage, third year corn a 50-70% risk of losses from corn rootworm larval feeding and fourth year corn risk for rootworm losses is between 80-100%. Adult rootworm scouting procedures are available and help to decide if the field is medium-high risk for larval damage the following growing season. Adult beetle scouting occurs around pollination and is conducted for three subsequent weeks. If beetle counts average 1 beetle per plant and the females have mature eggs, the field is at risk for larval feeding damage. Adult beetle scouting does not account for the subsequent larval mortality when the soils are waterlogged during the hatching period, so using adult counts to estimate risk usually overestimates risk. Assessment of the rootworm larval population after hatch is difficult and very labor intensive. Since first year corn has zero risk from rootworm larval damage, the standard seed treatment (Poncho, Cruiser 250) is all that is needed for protection from germinating-seedling damaging insects. Second through fourth year corn need some protection for potential corn rootworm larval feeding. Risk of rootworm feeding damage increases with the duration of continuous corn within a field. Since first year corn has zero risk from rootworm and second year corn has reduced risk (25-35%), a shortened corn rotation reduces the need (and cost) of rootworm management. Producers who can only grow two years of corn before rotating to a non-corn crop can frequently grow corn without any extra rootworm management expense. The high rate of seed treatment (Poncho 1250, Cruiser 1.25) offered for seed corn has activity on corn rootworm larvae. In growing seasons with adequate rain fall and moderate corn rootworm pressure, the high rate of seed treatment will provide adequate protection for the crop. In situations where the field has high rootworm pressure, the insects often overrun the insecticide, resulting in economic root feeding damage. High rates of seed treatments are also challenged to provide adequate control during times of limited rain fall during June-July or in times of excessive rain fall during the same time period. Use of the high rate of seed treatment is best matched to the second and third year of continuous corn when rootworm pressure is lower. The use of liquid soil insecticides (Capture, Force) mixed with the liquid starter fertilizer and applied in-furrow has become a popular option for growers without granular insecticide boxes on their corn planter. Past research in NY has consistently shown that either of these two insecticides applied in this manner are highly variable in control. In talking with farmers who are avid supporters of the use of liquids in this manner, they frequently admit to control failures consistent with the research results. The major issue with this application method is not the efficacy of the insecticide on the rootworm larvae, but the timing of the application with a liquid formulation. Application of a soil insecticide at planting is introducing the soil insecticide into the soil environment three to four weeks before corn rootworm larvae begin to hatch. It has always been a challenge for soil insecticides to still be in the root zone 3-5 weeks after application so the insecticide can be present to kill the newly hatched larvae. Granular insecticides bridge this time period with the slow-release properties of the granule. High-rate seed treatments bridge this time period with the slow-release properties of the seed coating. Liquid insecticides mixed with liquid fertilizer and applied in the seed furrow at planting does not have any slow release properties. Heavy rainfall events in the 3-5 weeks between planting and rootworm hatch flush the liquid insecticide out of the root zone along with the starter fertilizer. Heavy rain fall events during May-early June is not an unusual event in NY. Highly variable efficacy of liquid insecticides applied at planting are more directly linked to the lack of a slow release formulation and being flushed out of the root zone than the efficacy of the insecticide against rootworm. In their best years in research plots, liquid insecticides were also challenged to suppress heavy populations of rootworm larvae. Liquid insecticides applied in-furrow with the starter fertilizer is not recommended for rootworm control in NYS. Granular soil insecticides applied at planting were the primary management strategy before the introduction of seed treatments and rootworm-active GMO trait in the corn. They remain a very effective tool to manage corn rootworm and were left behind due to the convenience of the newer technologies. For producers who have insecticide boxes for their planters, granular soil insecticides provide a more reliable management tool than either high-rates of seed treatments or liquid insecticide applied in-furrow with the liquid fertilizer. Each different granular insecticide has its strengths and weaknesses and I will try to summarize them below. Force 3G is a widely used soil insecticide in corn production. It performs best when soil moisture is adequate to in excess due to its low solubility in water. If a producer calibrates accurately, use rates can be reduced to 75% of the label rates for moderate rootworm populations. In dry years, even a full label rate faces challenges controlling rootworm populations due to the insecticide’s low solubility in water. Force is effective across all soil PH ranges. Counter 15G, 20G is an effective soil insecticide against corn rootworm larval populations. This insecticide performed best in dry to moderately wet soils, but was challenged to perform adequately under conditions of excessive rainfall. Counter has a higher solubility in water than Force and effective across all soil PH ranges. With the introduction of ALS inhibitor herbicide, Counter was shown to have a serious interaction leading to plant injury. An introduction of a 20 CR (controlled release) granular was attempted with variable results. Due to the herbicide interactions, the use of Counter was significantly reduced by producers. Lorsban 15G has been an effective soil insecticide against low to moderate populations of corn rootworm larvae. However, this insecticide is PH sensitive and cannot be used in soil PH above 7.8. In the high PH soils at the Cornell Musgrave Farm, Lorsban was deactivated by the high PH before rootworm hatch. In soils with PH of 7 or lower, this material can provide effective control against low to moderate rootworm population levels. If producers are serious about growing non-GMO corn, they need to invest in granular insecticide boxes for their planter if they do not have them. Granular insecticides are the only reliable way to control corn rootworm larvae across corn rootworm population levels and weather conditions. Liquid insecticides in liquid fertilizer applied at planting demonstrates highly variable control and is a poor investment. High rate of seed treatments are effective against low to moderate population levels of rootworm larvae and are sensitive to soil moisture levels. Granular insecticides provide the most consistent control of corn rootworm. However, in most situations, the corn planter operator needs to have a Pesticide Applicator License.